Commercial cream (i.e. the cream you buy in your grocery shop) is homogenized. As a consequence of that, butterfat (aka milk fat) is not easily split from the cream, which of course is a must to be be able to make butterfat (out of the homogenized cream). 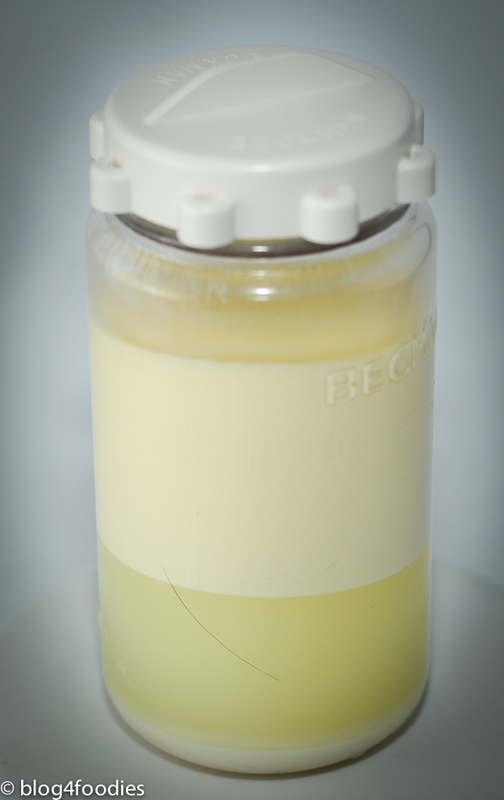 As a comparison, the fat floats to the top by itself in farm-fresh milk. In accordance to the Modernist Cuisine cookbook, the solution to this problem is to add 1% Locust Bean Gum (LBG) in proportion to the cream used. The butterfat taste from this procedure is more sweet in comparison to the commercial butterfat that I usually frequent. One reason is that Swedish butterfat (that I am most used to) has lactic acid bacteria added to it which makes it more acidly than most outer butters from around the world. Gallery | This entry was posted in Centrifuge, Food and tagged centrifuge, Modernist Cuisine. Bookmark the permalink.